It's been a busy week for Web browsers. Chrome 10 was released a few days ago, and today sees the release candidate of Firefox 4. I decided to take a look at the two open source browser platforms to see which is best for business users. My examination was decidedly unscientific, and we shouldn't draw too many conclusions. If nothing else, pitting a release candidate against a final release might be a little unfair, although at this stage we can expect Firefox 4 to be ready for the public, barring a few small bugs here and there. For my test bed I opted for a low-powered computer--an old Intel Core 2 Duo processor laptop with 2GB of RAM, running 32-bit Windows Vista. The Net connection was 6GBit DSL. I created a fresh Windows account for testing purposes too, to avoid performance being impacted by "cruft." Mobile workers require a browser that doesn't eat up screen space with user-interface elements, especially if they're using netbook computers. A criticism of the 3.x releases of Firefox was that its navigation buttons were a little too large. Well, that's been fixed in version 4, which overhauls the interface arguably for the better. The program has also switched to a status bar at the bottom of the screen that disappears when it's not needed, just like Chrome. As you can see from the screen shot below, both browsers are pretty much neck-and-neck when it comes to space taken up by tabs and controls. Perhaps Firefox is a pixel or two greedier but that won't make any difference in the real world, and Firefox also has a "small icons" setting which saves a little space. For some reason Chrome opts for a much larger font to display URLs. I like this, but it's down to personal preference and it makes no actual difference to the space taken up by the controls. Both Firefox and Chrome had easily accessible full-screen modes that slid the interface elements and Windows taskbar out of the way and dedicated the entire screen to web pages. Sadly, neither lost the right-hand scrollbar, which could easily have disappeared in the same way the status bar does, only reappearing when it's moused over. I used various test Websites and thereby wandered into a minefield. No test is perfect, or representative, and in some significant ways these results should be taken with a pinch of salt. However, to the best of my knowledge, we currently lack "real world" benchmarking. We can't yet test performance in Google Docs, for example. Chrome was the winner here, with a score of 100/100, although the Firefox release candidate was close behind with 97/100. Next, I ran the browsers through The HTML5 Test, which tests compatibility with the forthcoming HTML5 standard. HTML5 aims to revolutionize Web applications, although it's very much a work in progress. 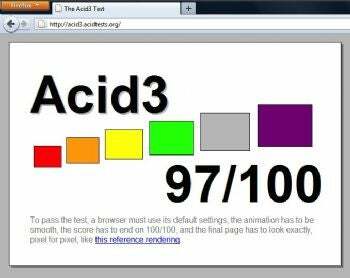 Chrome 10 beats the Firefox 4 release candidate in the punishing Acid3 compliance test. Again, Chrome was the winner with 288 points, plus 13 bonus points out of a potential total of 400 points. Firefox lagged behind with 240 points, plus 9 bonus points. Chrome scored 375.4ms, but, with lower scores being better, Firefox was the winner, finishing the test in 345.7ms. However, the scores are so close as to be practically indistinguishable.